If your two-way radio environment is a business with a mixture of digital and analog FM, or only analog FM and your contemplating which digital radio to adopt then we recommend the new Kenwood NX3000 series. You will find this two way radio offers future-proof flexibility with support for both NXDN and DMR digital air interfaces. As well as FM analog – all in a single two way radio you will also find a digital protocol can be selected at will. This gives you the freedom to migrate to digital or expand your digital environment further at your own pace. Also, it offers unique capability to add or delete functions at will. In addition to the future proof technology, the NXDN protocol can fit into the very narrow 6.25 kHz bandwidth using FDMA technology. Ensuring excellent spectrum efficiency, wide coverage and high scalability. 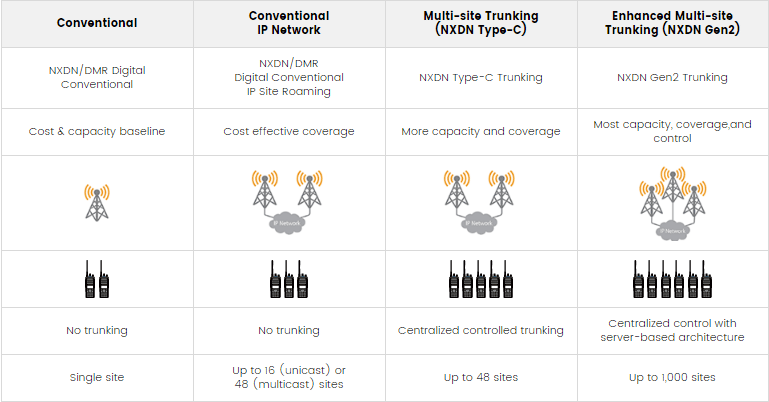 With this in mind expansion is possible not only statewide but also nationally: In addition to NXDN Conventional, NXDN Type-C Trunking and Gen 2 Trunking offer enhanced features, flexibility and performance, including the ability to link up to 1,000 sites. FM analogue protocol is offered in 25 kHz* and narrow 12.5 kHz channel spacing. Conventional and LTR systems are offered including QT/DQT, DTMF 2-tone/ 5-tone, MDC-1200 and KENWOOD’s own FleetSync® signaling. The Kenwood NX3000 Series portable two way radios are available in 3 configurations. From left are Full keypad, Standard keypad, and Basic (without LCD or Keypad) models. Capability to operate in digital protocol allows you to extend your channel capacity. The NX-3000 radios are designed to fit in different systems, from shopping mall or hospitality setting using conventional digital system in NXDN or DMR, to wider multi-site trunking systems using IP networking such as NXDN Type-C and Gen2 that extend across a campus or plant, even as wide as state/province or nationwide. Accelerating Productivity & Safety in Todays Workforce.